For more details about our classes, please click here. New! 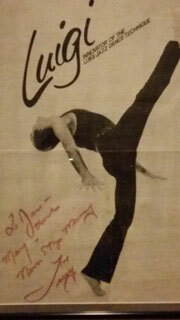 Meet Me at the Jazz Barre! Super easy jazz warm up done at the barre, based on the therapeutic movement technique of beloved jazz master, Luigi! Traditional, Vaganova style, classical ballet training. Stretch and Relaxation for Everyone! Start your afternoon with a revitalizing class to carry you throughout the rest of your day! This signature stretch and relaxation class caters to all who wish to improve mobility and increase flexibility of the body, mind and spirit! Refine your coordination, breathing and fitness through gentle stretching and strengthening movements for all muscle groups. You will learn breathing and stretching techniques that help to relax, lengthen and strengthen your entire musculoskeletal system! This stretch and relaxation class also helps to release stress, toxins, and discomfort associated with fatigue, arthritis, fibromyalgia and chronic pain syndromes. Stretching can make a difference between a sedentary or more active lifestyle and is totally adjustable to your body. “There is no gain with pain.” The key is relaxation. 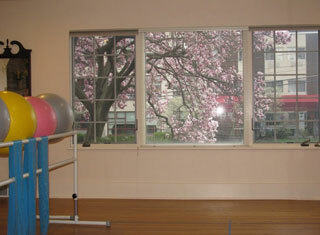 Exercises are done with barre support, seated and on floor mat. Wear comfortable, loose clothing, sneakers or bare feet. Classes for the absolute and curious beginner to the well seasoned dancer. Come join us in this workshop series where you can experience several dance genres, techniques and expressions. 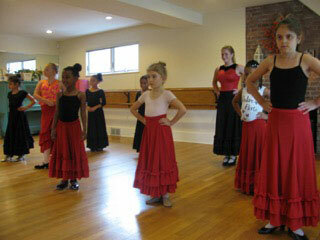 These mini classes will introduce you to the fundamental movement elements of a classical ballet barre, Luigi jazz: a dancer's warm up, an uplifting musical theatre routine, percussive modern dance, beginning Spanish dance and Flamenco rhythms, and the Spirit-filled Choreography Workshop (as shown here). All classes focus on proper body alignment, balance, style, musicality and enhances memory skills! Wear comfortable clothing, active wear, sneakers, dance footwear, all are fine! We begin the basic study of classical ballet in this introductory class. 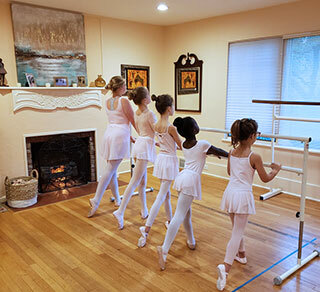 Children are taught the fundamental positions of classical ballet footwork and carriage of the arms. Classical technique is developed through the exercises, combinations and vocabulary practiced at the barre, in centre and en diagonale. It is here where we focus on proper posture, breathing, balance, muscular strength and flexibility. Exploring musical and spacial awareness also enlightens each student’s progress! “Parent Observation Day” is scheduled at the last class. Children naturally love hand clapping & foot stamping rhythms! In this introductory class, we will learn proper body alignment, classic arm, hand & foot positions while practicing basic Palmas (hand clapping rhythms) & Zapateados (foot work & rhythms) as an essential form of percussion, along with an introduction to using Palillos (castanets). A low heeled shoe or boot (not a wedge) is suggested footwear to create a distinct sound. Some skirts are available for studio practice as well as castanets, Ole’! With this gentle sun style tai chi form, you can learn to manifest your internal power to bring peace of mind and energy to the body with a healing sense of balance and spiritual well-being. The body, mind and spirit can become a storehouse of unreleased tensions if not cared for and exercised properly. Sun style tai chi is therapeutic and fulfilling for all ages and abilities, using a higher stance, agile steps and qigong focused breathing exercises. This gentle “moving meditation” is taught in an encouraging stepwise fashion and is an excellent tool for osteoporosis and fall prevention, balance, concentration and memory. Wear comfortable clothing and soft soled shoes or sneakers. This medically endorsed movement class is specifically designed with your child in mind. We will focus on a combination of comforting stretch and tai chi movements, always ending our class with another accomplishment! 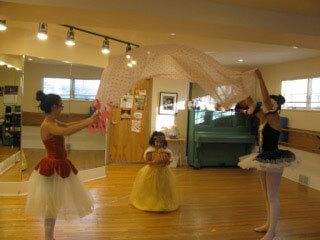 Pre-ballet and the creative joy of movement! This class is devoted to developing and enhancing the coordination, musicality and creativity in the young child. 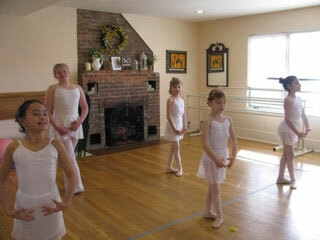 Movement qualities and the fundamentals of ballet are introduced through guided movement and imagination. The exploration of each child’s free-spirit is encouraged through their own dancemaking. The magic of entering a whimsical garden and all that can be discovered there is the inspiration of this joyful class. Throughout the session, we have “bring a friend day” and “dress up day” and the “parent observation day” is scheduled at the last class! Leotard, tights or leggings, and ballet slippers suggested. All classes are limited to 8 students and are based on a 4 student minimum enrollment. Your comfort and personal attention is important to us! Please call 518.273.1926 for further information, to request registration and medical release forms, and to reserve your place in preferred class. We do not offer online registration. (*ME) is Medically Endorsed fitness/wellness program for post PT patients and physician approval. Everyone is welcome! © 2017-19, The Movement & Dance Studio, Inc. All rights reserved. Site design by Taconic Marketing.